Cogmind (Steam link) is a unique roguelike game. It is generally in the traditional style, a turn-based map exploration game. 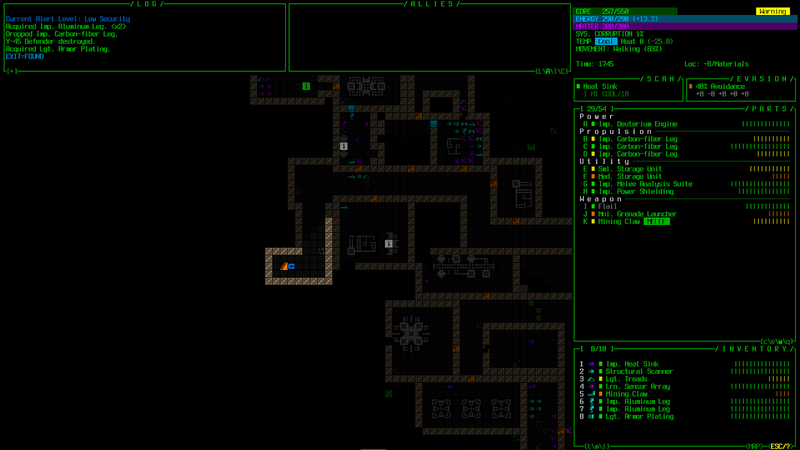 The default graphics are done with tiles, but beneath them it even has the ASCII interface aficionados know and love. As with many traditional roguelikes, there's a heavy emphasis on the items you find. In fact, the items are most of your character. Although you get the opportunity to upgrade the number of item slots each of your bot's four major areas, Power, Propulsion, Utility and Weapons, slots are useless unless there's something in them. And those items are often taking damage or wearing out, frequently requiring improvisation on the part of the player. This interview with Cogmind's creator, Josh Ge, is nearly two years in the making! The possibility arose back at Roguelike Celebration 2016, but various things kept coming up. We finally concluded it mid-October 2018. Because of this, some of the information in the first section is somewhat out-of-date. Most of this interview was conducted over Twitter, with some email. It has been edited for publication. This interview was first published in the fanzine Extended Play, available for free on its homepage and on the Internet Archive. It's also available from the @Play blog. John Harris: First off, who the heck are you and what is Cogmind? Josh Ge: I'm a roguelike developer relatively late to the party, having only discovered this great genre by way of DCSS in 2011. 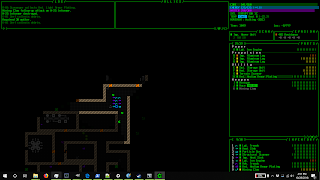 Roguelikes immediately took over my life and I began work on X-COM: UFO Defense-adaptation [email protected], followed by a 7DRL in 2013 and REXPaint, an ASCII art and roguelike development tool, that same year. Shortly afterwards I started developing Cogmind (originally that 7DRL) full time, having logged over 6,000 hours in the past few years. With Cogmind I'm trying to innovate on the genre without losing that core roguelike experience, by drawing on methods and concepts more commonly found outside roguelike canon, like advanced particle effects, the broadest soundscape ever to appear in a roguelike, and a living world where not everyone and everything is out to kill the player. JH: Ah, that's kinds of high-level and vague though. Let's get a little more concrete: what is your character in Cogmind, and what is it trying to do? JG: In Cogmind you play a robot whose abilities are derived purely from what components you attach, hence there is no XP or grinding, and by necessity or choice your loadout might undergo significant changes throughout a single run. I don't want to spoil the background or story, but strictly mechanically speaking you start deep underground and are trying to reach the surface of the world, usually via some nonlinear route. You can either fight your way out or rely more heavily on stealth and hacking, but in either case, understanding and adapting to how the world as a whole perceives and reacts to you are vital skills for survival. By the end you have over two dozen active components (you know, a-z) working together in a synergistic fashion, many of them possibly scavenged from fallen enemies. JH: Ah okay. 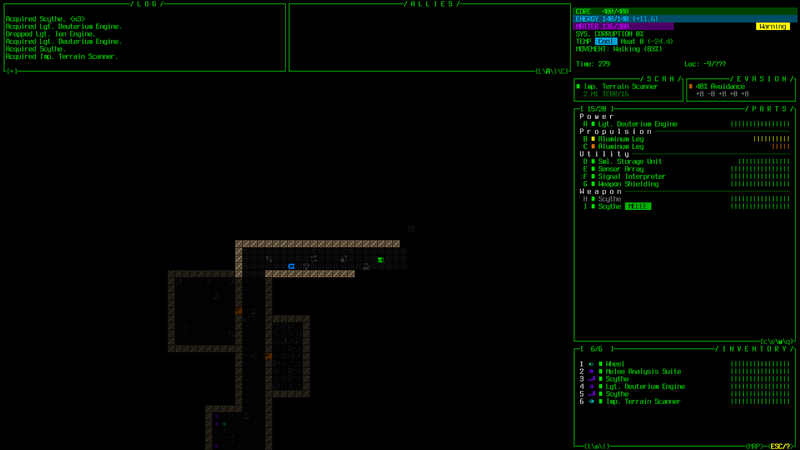 That's kind out outside the basic "lone human exploring a dungeon" structure that's traditional for roguelikes. What is character creation like? JG: That's just it--there is zero character creation. You start out naked, and basically create your character on the fly by collecting and attaching parts, or taking those parts from other robots. 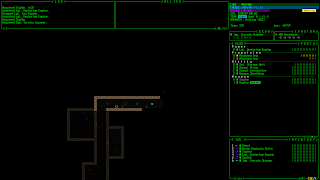 Items are a lot more common than found in classic roguelikes, as destroyed enemy robots can each leave behind multiple parts to salvage, and there are hundreds of parts strewn throughout a single map (though maps are also quite large to accommodate the different space needs, usually ranging from 100x100 to 200x200). Equipment and inventory management naturally becomes a big part of the gameplay, and therefore the interface is designed to streamline a lot of it. JH: So, do you generally always have the same parts available every game so you largely make whoever you want, or are some more common than others, forcing the player to adapt and make use of what he finds? JG: Yes and no. There are currently about 900 different parts in all, and while many will be found randomly, a lot of them also come from salvaging the remains of other robots. Robots have static loadouts, therefore understanding which types of robots carry what is a way to work towards putting together a certain type of build. 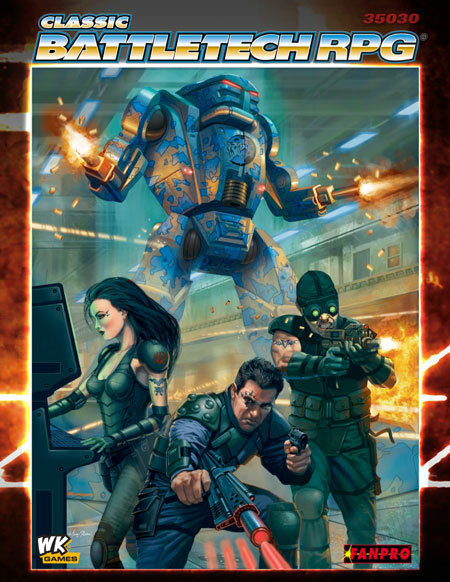 For example ambushing lone Sentries for their armor and treads to take a more combat-oriented approach; then maybe destroying Hunters for their targeting computers and kinetic weaponry. There is also a system for "fabricating" specific parts that you really want but cannot find. Still, players who can't adapt do not get very far! This is especially true because Cogmind includes item destruction--you can lose everything and anything you have attached. All parts are destructible, and that's a core part of the gameplay. But pretty much every player can describe runs where they've found themselves in one bad situation after another and are stripped naked, only to flee and rebuild into some new form not long after. JH: Let's talk about the level generator next. One of the most interesting aspects of the game I've read about so far is that there are entities in the game that are responsible for digging passages and rooms. How generally does dungeon generation look? Are those entities I mentioned responsible for all the dungeons, or do they just mix things up a bit after the dungeon's already generated and in play? JG: Map generation is actually handled in full before the player enters a given map. The in-game tunnelers and engineers sometimes seen building little new areas are purely for fluff/theme purposes, and are actually drawing on information the dungeon planner had already decided on beforehand. They do represent one of the key AI features, though, that every entity in the game has one or more real functions that either generate changes in the world or react to changes caused by the player or other entities. JH: That is interesting I think. So, if the player prevents those units from finishing their job, the level ends up half-finished? And could you give us some more examples of entities performing some side function other than being opponents? The analogy that comes to mind, BTW, are cells in a body, how they each have important roles to play in keeping it alive and healthy. JG: Not by any means half, as it's just a small number of areas that work like that as a bit of fluff, but the analogy is overall very apt. Most of the robots you see in the world (by absolute number) aren't there to fight you, but carry out their own duties which have a real impact on the operation of the world. You can do your best to avoid disturbing the peace, and thereby stay out of trouble, or be a hostile presence that disrupts these operations for whatever purpose. Sometimes causing trouble is unavoidable, like trying to stop Recyclers from coming to take away the salvageable parts remaining after a confrontation. Those are probably valuable to you when trying to rebuild! There are Engineers which rebuild destroyed parts of the subterranean complex, Workers that clean machines and pick up debris, Mechanics that repair other robots, Haulers that move stockpiles of components, and more. JH: What kinds of limits are there on just being able to get "one of everything?" Inventory size, equipment slots, power source? JG: Items are divided into four types of slots: Power, Propulsion, Utilities, and Weapons. You start with 2 free slots for each (except 1 for power), and gradually gain more slots as you reach new areas--you choose the slots to "evolve." The base inventory size is 4 slots, but can be expanded by using storage utilities. JH: You mention that most of the combat is with ranged weapons. One of the things about roguelikes is that missile weapons are always a bit more annoying to use than melee, because you typically have to enter a special aiming mode to attack. Does Cogmind have any ideas for remedying this? JG: Cogmind's UI streamlines everything as logically as possible, so when it comes to attacking with ranged weapons, 'f' enters firing mode, and that automatically aims at the the closest target in range, or the one you last attacked (if there was one). Then 'f' again fires, so ranged combat is often as easy as hitting 'f' twice. For combat with multiple hostiles there are also easy hotkeys such as Tab for cycling through all available targets using the same priority/preference system, and Shift-Tab to cycle in reverse. It's all pretty fast. Cogmind also offers full mouse support for everything, so naturally for mouse users it's as simple as clicking on things to shoot them. 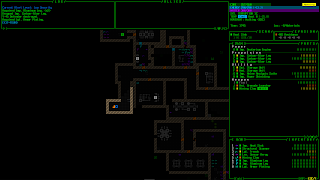 JH: Let's talk for a bit about what's one of the most immediately striking aspects of Cogmind, the graphics. It uses graphic tiles for the game world, it seems, but ASCII for the interface and, amusingly, ASCII-art portraits for items. Is there anything you'd like to point out about the graphics? How long did it take to make all that art? Did using ASCII help, in the Dwarf Fortress style of taking less effort to construct a very large number of objects? JG: Well, first of all Cogmind was actually designed purely in ASCII and for ASCII, even on the map, and about 25% of the current player base uses that mode. The tileset didn't even exist until more than two years into development, a few months before I released the first public version, so ASCII is very much at the core of the design, and even the tileset style I chose sticks pretty closely to that underlying aesthetic. That was important to me as both an attempt to keep the benefits of ASCII-styled tiles, while also helping the overall interface feel more cohesive. There are currently over 800 pieces of ASCII art for items, and another couple hundred for both interactive and non-interactive machines. 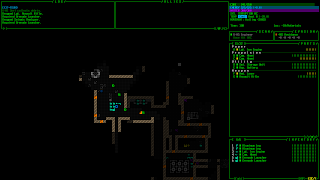 Altogether I've spent exactly 326 hours on just the ASCII art for Cogmind (yes, I keep track of stats like this :D). That comes comes down to an average 26 minutes per piece, which sounds about right. (I also have a bunch of failed/inappropriate/surplus art that got thrown out as part of that process, too.) So while individually I find each piece less difficult than I would pixel art, it's still fairly time-consuming to get it all just right, not to mention the significant multiplier when it comes to doing this for hundreds upon hundreds of objects! JH: So, let's say I have just started a game of Cogmind. What does the general "shape" of the game look like? That is to say, are there major tasks to accomplish on the way up, like subgoals that must (or just could) be done, or is it mostly just a sort of a homogeneous journey? Like... the archetype that always comes to mind for me for this kind of thing is The Odyssey, where the nature of the journey changes several times as Odysseus returns home. In NetHack, after the initial period, there are some bits where the game changes in fundamental ways: the Mines, the Quest, the Castle, Gehennom, the ascension run and the Planes, each of which have major differences from the others. In other words, how varied is the trip up in Cogmind? JG: There are several ways to look at this. In terms of the world structure as a whole, I can't get into the details because spoilers, but while everyone starts from the same point there are a number of things you can do which have a significant impact at some point later on, or even throughout the rest of the game. Most of these elements don't come into play until the mid-game, but experienced players are able to leave the early-game areas within about 15 minutes (survival becomes increasingly challenging the further you get). None of these are absolutely required, but a player may decide to aim for a certain area to take advantage of whatever longer-term benefit it provides, be it a highly specific "doing this will later trigger something that I need" or a more general "this area is likely to have the kind of loot or intel I need right about now." The potential effects vary wildly, though they are not procedural; they're all features which were added very intentionally, designed to mesh with both the mechanics and lore. On another level, each type of map will tend to have its own unique mechanical quirks, and require unique strategic approaches. So the world is by no means homogeneous. And from an individual player character point of view, the aforementioned item destruction and potential heavy losses combined with the ability to eventually use 26 items at once mean that not only is one trip likely to vary from another, but even a single trip can include multiple unique phases. 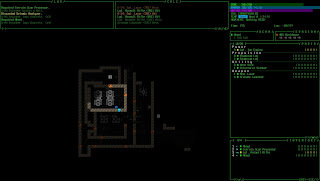 Compared to a class-based roguelike, for example, where at the beginning you choose to be a spellcaster and by the end you're likely just a better spellcaster, a single Cogmind might start out wanting to go at the enemy heavy combat style, but somewhere in the middle get crushed and have to flee, build back up into a guerilla-style hacker for a while, and then later find a sufficient cache of gear to once again transform into a fighter, likely with even deadlier firepower than before. Sometimes these are calculated shifts in strategy, and others they're just "going with the flow," where I believe Cogmind's design is at its strongest. JH: Well, let's talk then about how it's progressing. JG: It was first introduced at $30 in May 2015 on my site, and then half a year ago in May 2016 I lowered it to $25 for the anniversary. But it's gradually coming down and before long will be $20 by the Steam release. Regarding pricing I've been planning to write a blog post pretty soon to explain my decisions in more detail, but I prefer this model and it's working out quite well. Before long I'll also be looking to write a retrospective article examining Cogmind's evolution through alpha over the past year. As of today I've so far clocked 6,272 hours of Cogmind-related work since starting over three years ago. JH: That is a lot of time, even if you don't consider it "finished" yet. There is still a lot of value in a solid 1.0 release though, psychologically and to the players. Especially if you get a lot of players from a solid major version release, some issues may only turn up only after you get a lot more eyes looking at it, I'd think. JG: It's a labor of love. And the psychological meaning is certainly important to me. This is why I keep feeling tempted to postpone it while I make it "perfect" with all the other things I have planned. That said, there are already thousands of players. More than enough eyes, I think! JH: So, the 1.0 release is planned soon then? JG: Well, the main thing that bothers me is that even on my own long-term list of things to do, I'm aware of a near inexhaustible number of things that could be improved. This is without further input. And once I call it 1.0, newer players will certainly start to bring those things up, and dealing with that as a solo dev is a significant drag on development time, which is why I keep wanting to put off that release. The story could be completed within as little as one more alpha release. JH: So, that means you can play the game all the way through and reach a conclusion? JG: I believe there are some more accessibility issues I should address before daring to say 1.0, namely key rebinding and an OSX wrapper, which altogether could be rather large stumbling blocks. The game has had an end and conclusion since Alpha 1! What I'm doing now is adding all the outlying areas and alternative endings. JH: Aaah. So outlying areas then are like dungeon branches? And alternative endings are like, say, the "ultra endings" in ADOM? JG: What was missing for part of alpha was the ability to meet the NPCs that play major roles in shaping the world. Now there are only a couple of those left... Cogmind essentially has branches like DCSS, so yep, that's what I've been working on for the past year--adding more branches. All the branches are done now, except for a few little very special odds and ends to come soon. And yes there are multiple endings of varying difficulty, akin to ultra endings though probably not quite as involved. JH: Literally just before I typed this, you sent out a tweet saying you had just reached 3,000 players, and expressing hopes that the game would one day be profitable. What do you suppose it would take, in terms of sales, for that to happen? JG: Since this is my full-time job, I certainly keep a close eye on the financial side of things. 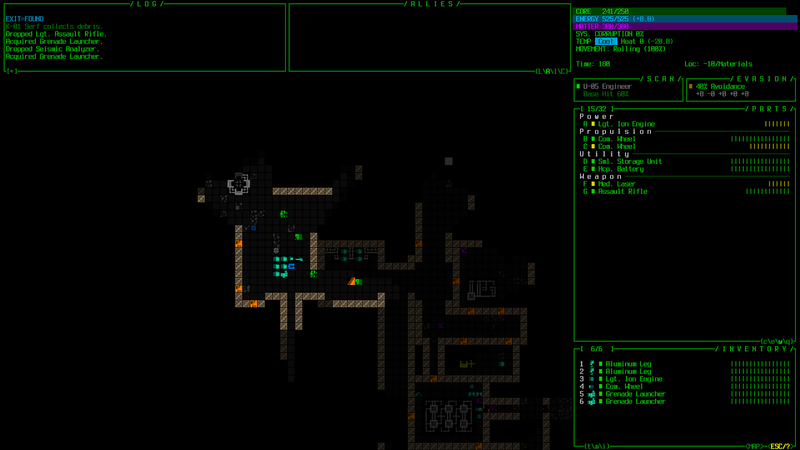 As much as I dislike having to do that because my primary goal is to simply make a great roguelike, the only way Cogmind has been possible is through the community support that's kept development humming along for quite a while now. I could've pretty easily tapered off the roadmap and called it done last year, and by now it would've paid for itself, but what I decided to do instead is make the world and feature set much larger than initially planned. The thing is that means it's nearly impossible to break even for now because I continue to spend time/money on development while player growth maintains a pretty even pace, sustaining development without really accelerating to fully catch up to my progress. That said, there have been good concentrated sales boosts like the times RPS/PC Gamer have written about Cogmind, and the initial launch which attracted support from a lot of long-time fans. So if I were to stop developing now, fewer than 3,500 players would be enough to break even. But as I mentioned before there's still more I want to do with Cogmind, even after declaring 1.0! And I'm cool with that plan for now, but I do also have to consider that at some point in the future I would like to have extra funding left over to create The Next Roguelike. Not to mention it's rough doing these ridiculous hours at minimum wage! JH: Let's get back to the game itself... you talked a bit about how the other characters in the game have their own lives independent of their interactions with the player. What kinds of things go on in the game world when the player isn't around? JG: Earlier I brought up some of the engineer, worker, mechanic, and hauler behaviors, and while there are more, discovering how the world works and what happens is a part of the experience I don't want to spoil. I do try to play it down, though--it's not as expansive as all that, i.e. they're not really "lives" in the sense of AAA RPGs and their AIs with unique routines and whatnot. That's on the generic side, while in the case of unique NPCs or those with dialogue, they're out there doing their own thing and the player is basically a side show to all of it. Sorry but I can't really talk about this stuff in detail. JH: Is there anything in particular about your game that you think stands out, that you rarely get the chance to mention? JG: Well I talk about Cogmind a lot, and write about almost everything I do in great detail on the dev blog, so not really :P. But because I've been working on it for quite a while and there is so much information out there already (easy to get lost in it all! ), some time ago I put together a collection of images that summarize the types of things Cogmind is doing for the genre that have never been done before, or are rarely seen: http://www.gridsagegames.com/cogmind/innovation.html. Though what individual elements stand out to each player are going to be different, probably the number one aspect that all other design decisions revolve around is immersion. It seems unusual to say that about a turn-based ASCII roguelike, but the sci-fi/robot/hacking theme combined with a vivid soundscape has worked out really well. I love fantasy games as well (before [email protected] I spent five years creating a fantasy SRPG), but I feel that if I'd gone that route it would've been much more problematic to create such a believable world. JH: Are you familiar with the Commodore game Paradroid, and was it an inspiration for Cogmind? Beyond that there are many other inspirations, mostly from outside video games, but that was the initial spark. JH: In the 1 1/2 years since we last talked, you mentioned the ASCII effects. They've just gotten better in the time since then I think. How does the game display? Is it in a terminal window, or is it a graphics window with rendered ASCII? In the latter case, is there ever any temptation to "cheat?" JG: It's an emulated terminal in the vein of libtcod, so yes it's essentially copying fonts from an image to display on the screen rather than using a regular font file. This allows the graphics to be pixel-perfect at every resolution, for which I've put together over 100 handcrafted bitmap fonts, and Kacper, the tileset artist, drew five separate sets of the same tiles for each primary tile dimension. It's actually not possible to cheat, though, at least not without switching to a different engine, because all it can do is render ASCII onto grids and assign each a foreground and background color. Technically it wouldn't be too hard to, say, add health bars for enemies using some sort of new overlay feature, but I'd rather find solutions that work within the terminal style itself. Once you've laid down a set of graphical rules and designed for those rules, breaking them later on inevitably leads to inconsistencies, and inconsistency is generally a bad thing in video games, especially where aesthetics and UX are concerned. Having clear limitations set in stone early on is great, though. It's all about getting creative to maximize both the informational and aesthetic qualities of the interface. JH: If I read the notes right, there is a variety of ways to go about playing through the game, right? Like, combat, evasive, etc. Are there any specific kinds of playstyle that you aimed at supporting? Like, explicitly allowing to player to take on a D&D-ish role: an evasive rogue, a hard-hitting fighter, an area-effect wizard, a healer-mechanic, maybe a character with good diplomacy skills like a bard, etc? JG: While there are a range of unique play styles, and hybrids in between, early on I had no explicit aims there. 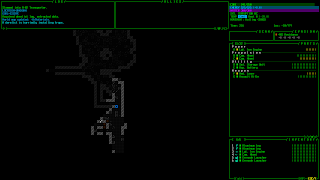 Cogmind's initial design came from the 7DRL, and the idea was to simply focus on implementing the core mechanic and making that interesting and fun. Although in building it I noticed right away that, coincidentally, three of the main categories of parts did to some degree conform to D&D tropes: propulsion is for your speedy/stealthy rogue, utilities are for jack-of-all-trades mages, and weapons are... yeah. So by evolving more of a given slot type, your build will naturally lean more towards that style. In reality it's more complex than that, especially now with nearly 1,000 parts, and especially the utility category, which is the most versatile and can support any style--it's more about the individual parts. 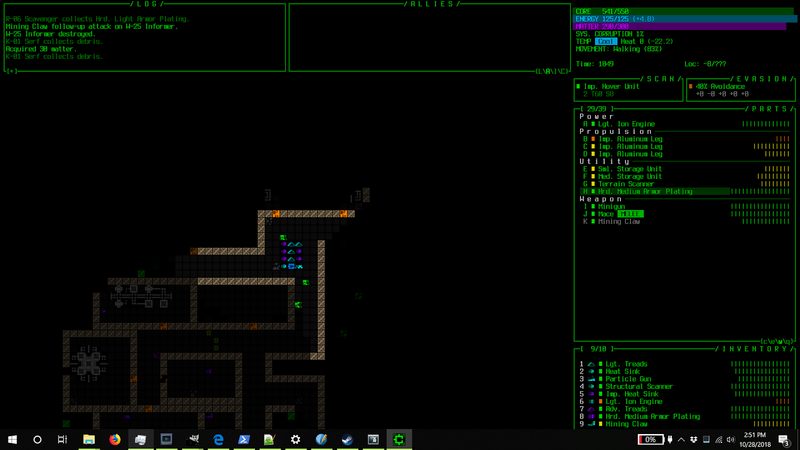 Related to this topic, we did a r/RoguelikeDev FAQ on Character Archetypes, at https://www.reddit.com/r/roguelikedev/comments/659d61/faq_friday_62_character_archetypes/, in which I gave a rundown of Cogmind's more typical build styles as of last year. It's interesting that you bring up this question now, though, because the very next release is specifically focused on adding a new play style, one which can also optionally be mixed with almost any other style in hybrid fashion for pretty good results, too. The new robot hacking system (https://www.gridsagegames.com/blog/2018/07/robot-hacking-take-2/) doesn't have any direct analogs in fantasy, but could be seen as a sort of mix between rogue and mage, a strongly utility-focused "class" that operates outside the standard rules of combat and avoidance. Last year in talking about the concept of this class and the strategic space it could fill, players also referred to it as the "commando" build. This is a major change from the older, simpler robot hacking system, which was focused on either disabling or befriending enemies, and when working on the older build style I very clearly had the idea to make it sort of the "summoner" of Cogmind. As I talk about in the blog post linked above, players eventually figured out how to take advantage of this system and I had to nerf it :P. Anyway, it'll be replaced my a much cooler and deeper system soon! JH: The difficulty with designing for a variety of playstyles is allowing a character playing in unexpected ways to not encounter impassible roadblocks. Like, to go back to D&D as an example, a mage character encountering a must-defeat foe who is immune to magic and too strong for their meager fighting skills, or an enemy with perfect perception against a thief. 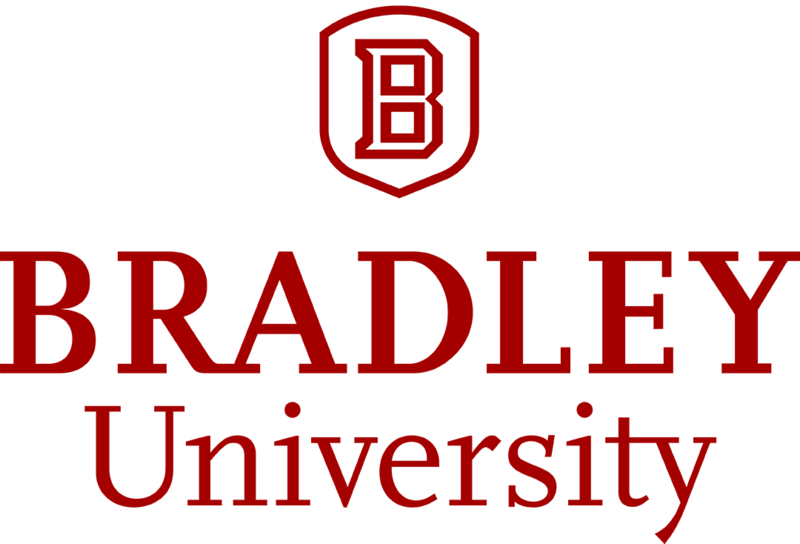 One wants all trials to be passable with many different styles (or at least avoidable), without watering down the challenge. I imagine that must be tricky. JG: Part of the way I got around the "impossible roadblocks" issue was by making almost everything optional, especially the most challenging areas. And of course running or circumventing danger is always an option. Many people who haven't played Cogmind don't realize that it's actually a stealth game. And most of Cogmind's world is optional, so players who aren't equipped to take on certain challenges can simply avoid them. But I do also explicitly design for multiple approaches to challenges in most cases. Personally I prefer the Shoot Everything approach to play, as do some, but then there's a large portion of players who enjoy the sneaking around and creatively overcoming obstacles rather than facing them head on. JH: I wonder if you've given any consideration to a "pacifist" character, who eschews all weapons, maybe a peacemaker with high robo-charisma that only uses discarded parts? Well, it's an idea, heh. It's entertaining to think about but might not fit the game. JG: Pacifist runs are already a thing in Cogmind. There's an official score bonus for it (which increases with every depth you don't kill anything) and people do that! Pacifist speedruns earn a lot of points and can get pretty high on the leaderboards to reasonably compete with combat runs. JH: How easy is it to acquire new parts if you aren't making them yourself, so to speak? JG: Easy, since all robots are made of parts. JH: Do you have to race scavengers to them? JG: Nah, you can just shoot at the Recyclers and they'll run away. Although there is often a bit of drama there because they can arrive while you're still fighting, if it's a prolonged engagement. So you have to decide whether it's worth taking time out to shoo them. Battles can sometimes end with relatively clean surroundings, which can be dangerous if you aren't carrying enough spares for damaged gear! JH: Reading through the interview from before, I like that the game feels like a world to itself, kind of almost like an ecosystem. JG: It's very much an ecosystem, and I'm always adding new elements to that, making sure that any new system ties into multiple other aspects of the game, or even AI. Like the new robot hacking system, that'll introduce a couple new jobs for one of the common robot classes. JH: That kind of reminds me of another thing Cogmind is sort of sideways-adjacent to, the obscure Gamecube game Cubivore. It's an action game where cubical animals tear parts off of other animals and eat them, and grow new parts that they've obtain. JG: Oh wow that does sound interesting. One of the big decisions very early in 7DRL dev, and again when I wanted to make Cogmind a commercial game, was whether to introduce biological parts. I imagined working a whole separate faction into the story which could be based on biology instead of machines. JH: Biological parts seem to me like they'd be kind of less interesting, like thematic drift. Not that they couldn't be made to work, but it's like.... Cogmind is a game where you construct your robot as you go by taking parts from other robot. It feels like that's "enough." To go beyond that feels like it might be sequel territory. JH: How is it coming along, BTW? It has been like a year and a half since the first part of the interview. Is it still beta? Or alpha? Has it hit an "official release," whatever the heck that means these days. The animations look very polished. JG: Beta 3 launched on Steam October 2017. The story is 100% complete as is all the primary content, I'm just adding lots of extra stuff for fun now, and do need to finish a few final required things before I'd call it 1.0. Currently it's Beta 6, and Beta 7 is in late dev. Already have solid plans for the next few Betas. JH: Ah, you're still getting money from sales along the way, right? Is there a 1.0 scheduled eventually? Cogmind 2 would be an alternative option in the long run, and allow us to explore more of the story and world that the first can't reach, so I like that idea as well. JH: Sounds like a Dwarf Fortress-style development schedule, heh. I'm glad it's working for you! JG: Oh yeah it very much is--both DF-style and working for me. JH: Is there anything about the game, the way it plays, it's "gameplay loop," you'd like to talk about? JG: Well, the core gameplay loop is quite tight, but one of the things which Cogmind does differently than other roguelikes that can be a barrier for new players, even (sometimes especially!) those with a background in the genre, is that there are usually numerous loops going on at the same time. It's not just about the enemies you're facing and parts and resources you have to manage, there's also the whole ecosystem to contend with. So coming up with a great plan for your current situation which only takes into account what you have and can see right now is almost certainly going to fall apart at some point, probably sooner rather than later. You'll need to improvise a lot as enemies warn other nearby enemies, or call reinforcements, patrols and other squads actively circulate around the map, non-combat bots sometimes interfere with your own goals, the global alert level rises due to your actions and you attract more attention, and lots more (some of it contingent on what you've done elsewhere/before, plot-wise). Also, the fact that item destruction applies to any item (armor or not the items are all protection for your core! ), means that unless your build is perfectly balanced and unlikely to succumb to attrition, you're going to have to carefully consider what kinds of spare parts to carry and plan ahead for how to acquire more parts when spares, or something vital from your build, is suddenly gone. So there's a lot to thing about in terms of the "item churn loop." Overall, high-level play is rather complicated and requires a decent amount of knowledge before you can be confident in survival, so it's not the kind of game you can keep throwing runs at and fooling around with in the hope of learning how to win. You'll have to really think about your decisions and their consequences to get further. Yes that describes a lot of roguelikes, but there usually aren't this many systems layered on top of one another, so it can be kinda overwhelming. It's also often difficult for new players to see exactly when they made the most important mistakes that ended up losing them a run, because death in Cogmind doesn't come swiftly and is usually a cumulative result of multiple mistakes made earlier on, but that's another tangent. Playing without regard for all these other factors is fun (I often sorta play like this when streaming my runs), but that low-optimization approach won't cut it if you want to tackle the extended end game, alternate endings, or other difficult challenges. JH: What would be some advice you'd offer new players? What is a good strategy to make it out of the early game? JG: All the best advice for that has been boiled down to a list of tips found in the dedicated Survival Tips section at the beginning of the manual (also found in game). It's really the only part of the manual that's recommended for new players to read, since the in-game tutorial messages and context help cover everything that's necessary in terms of mechanics. Though there is one other section at the beginning of the manual which talks about important differences between Cogmind and other roguelikes, specifically for those with experience. Knowing these in advance is a big help. Probably among the most absolutely important notes from those tips: Never leave any equipment slots empty, and also keep a full inventory at all times, often with a storage unit for extra capacity and therefore more spare parts. Attach replacement parts even in the middle of battle! And when encountering early-game enemies, try not to confront them in the open, instead retreat to fight in bottlenecks at point blank range because you have so much "health" (integrity) that enemies plinking you for a few turns doesn't mean much in the grand scheme. JH: After playing a couple of games, I notice a prominent early choice is whether to go for legs or wheels. From a beginner's standpoint, what are the advantages of each? How about when treads show up? How about projectile weapons vs. lasers? JG: Technically you can find any type of propulsion even on the first floor (including by taking them from bots that use it), though airborne propulsion is not advisable until after a few floors. In a general sense, propulsion exists on a spectrum from low support/high speed to high support/low speed, from flight -> hover -> wheels -> legs -> treads, so wheels are in the middle there and may appear to be a pretty well-rounded option, but not recommended for new players because they'll tend to get shot off quickly without superior tactics (or good wheels :P). I always recommend legs for new players, because they're the beefiest propulsion which is also pretty common. All types are valid, you just need to pair them complementary parts and suitable tactics. We just had the propulsion types question/discussion on the Cogmind subreddit: https://www.reddit.com/r/Cogmind/comments/9qg8hb/propulsion_proscons/ It can also be really effective to put together a hybrid build using multiple forms of propulsion. Weapon categories are the same in that there's a wide variety and each has their own advantages and drawbacks, but all the strategic possibilities combined with all the mechanics you have access to right away are rather overwhelming for new players, so one of the Survival Tips is to simply go with whatever parts have the highest rating, to avoid decision paralysis when starting out. Smart players will always carry a spare launcher and melee weapon though (in inventory), the former for taking out groups of weak enemies and the latter for chopping through walls to make shortcuts, or to use as a last ditch weapon when resources or weapons are low. JH: Things seem to get damaged easily, and weapons seem to degrade through use. Can you repair damaged systems, or is it something where you're usually switching things out? JG: Repair is possible via several means, yes, but it's not all that common, and not something you'll do until maybe in the mid-/late-game, and even then only if it's something which is vital for your build strategy. It's more common for experienced players to get ahead of the attrition issue by avoiding much damage in the first place, either by avoiding combat, evading hits, using shields or resistances for mitigation, or "the best defense is a good offense--neutralize everything before it can mess you up!" And once you know how to give yourself strategic and tactical advantages in many different likely situations, you'll end up taking a lot less damage overall and usually be replacing damaged parts with even better parts before you lose the first ones. JH: If your energy core gets destroyed but you're not, is there anything you'd suggest a player try doing to get out of trouble? JG: The best course of action depends a lot on the circumstances. You can escape almost any dire situation in Cogmind and come back to win, but in a very general sense one of the easiest ways to recover from a power loss scenario (certainly the easiest if you're not currently in battle!) is to just salvage a non-combat bot. The non-hostile green bots running around just doing their jobs can be a great sources of vital emergency parts, like power and propulsion. That should be enough to tide you over to a better power source taken from a combat bot. Also if there's already some nearby power source lying in the rubble from an ongoing battle, by all means head over and pick it up if that'll get your build back in working order! Don't worry too much about stray hits, I mean you're already less of a viable target when moving. JH: It seems to me that Cogmind has "programmed" character development, by which I mean, experience-like advantages are gained not through in-level accomplishments, but as a result of progression (after specific levels). Is this accurate? What caused you to use this system? Are there any ways players could end up ahead of/behind the curve? JG: Cogmind is very focused around what parts you use, so technically it doesn't have much in the way of stats at all. Only your core integrity increases with each depth closer to the surface, plus you get a tiny bit of "free" extra heat dissipation. That's it. All other capabilities and stats come from parts. While there are a few special ways to get ahead of this curve, they don't really come into play until later in the game, and using this type of progression is an important part of the design because that means you are free to become anything at almost any time. Unlike most roguelikes you're not "locked into a class," and this allows a lot more freedom across a run--you can be tanky for one section of the world, then stealthy while exploring another. Sometimes you are even required to "respec" like this in order to get the most out of certain special areas, evolving your build for different capabilities in ways that would be unreasonable to expect in a class-based roguelike. This ties in very well to the fact that there are so many different parts out there, acquiring them is fairly easy, and item attrition means in some cases you're even forced to rebuild based on your environment. I did play with a "modules that permanently upgrade your stats" approach for the Cogmind-like POLYBOT-7 this year for 7DRL, and it's fun, but results in a completely different experience built around that sort of thing. I wanted Cogmind to be entirely about your parts. JH: What are "prototype" items? What are the advantages and/or dangers of using them? JG: These are essentially Cogmind's version of the roguelike ID game and cursed items (at least that's where the idea originated), albeit not as nasty. Stat-wise prototypes are always better than similarly rated parts, sometimes way better, and sometimes they come with unique properties or abilities. So if you can use prototypes you'll generally want to. But sometimes they might be "faulty," in which case attaching them could cause your heat to spike, corrupt your system, temporarily disable other attached parts, meltdown and damage your other parts, or at worst permanently disable another part. Of course you can't tell which are faulty and which aren't, so attaching them blind carries that risk. As soon as you've identified one, however, all others of the same type are identified and you can distinguish which are faulty. Unlike cursed items in other roguelikes, you can remove them freely, so there's just that initial danger that they'll have some little side effect. There are many ways to ID unidentified parts before attaching them if necessary, or you can just attach them and hope for the best (they're not usually faulty). Even more than the risk-reward aspect, though, I really like the idea of simply being unsure what this presumably good part is until you actually attach it. It's kinda like finding an unknown treasure, you know its general type so you're already interested, but it could be any specific prototype and you're eager to know what that is, and could be really happy with the results. That anticipation is a great feeling, perhaps multiplied when you find many at once, which is not uncommon. JH: After playing a few games, I noticed the game started dispensing with the initial introduction, just plopping down my robot in a starting room with a variety of starting parts. I've also seen a message to the effect that the game tries to adjust itself to the player's skill. Is there a way to find out what the game's current difficulty is? Will it be possible for a player to turn that off eventually, say, in case he wants to test his skill, or participate in a tournament? JG: I think you might've misunderstood one of the messages there, since there is no dynamic difficulty, just a message referring the player to the options menu to adjust the setting if they find the game too difficult. 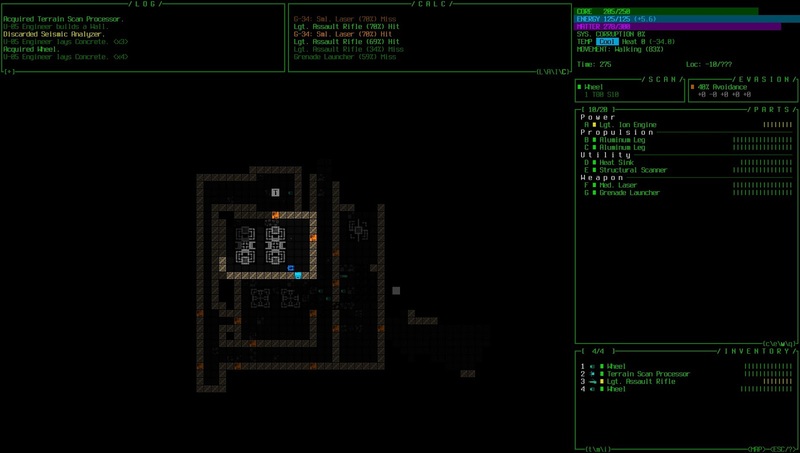 Mastering a game with relatively consistent, knowable difficulty is an important part of roguelikes for me, especially with Cogmind where any given run is already winnable, so it's more about improving one's own skill to meet and overcome the challenges balanced for the game, rather than hoping it provides a fun experience tailored specifically to you. As for the change to the starting area, yep after your third run it'll get rid of the four-room map and just plop you in that room full of parts. The four rooms were just built as a tutorial-by-layout where you'll encounter new elements in each room that coincide with the messages in the log as you interact with them, introducing concepts one by one, and by the time you've done those four little rooms you know... all the basic concepts you need to play! So the "real" start just drops you in a room of items ("the Scrapyard," as per lore) and lets you go. In fact, there's now even a quick-start option for advanced players that literally just attaches everything in that room, puts the rest in your inventory, and places you next to the exit. Technically Revision 17, that bot who welcomes you at the beginning, will occasionally appear at the start of a normal run just to remind you of the plot, since they play a role in it, just not every time since that could get annoying. JH: We've established that, outside the player-settable difficulty setting, the game does not try to scale the challenge artificially. But, is there anything else, besides the tutorial, that can change about the game depending on concluded plays? Like Nethack's bones levels, or unlockable parts or dungeon branches? JG: There are a number of meta activities that have only optional impact on the game, like the many achievements and the item gallery, where you can see your records of (and ASCII art for) every part you've ever used, but as for meta aspects that affect future runs, these are tied in to lore knowledge. There is a lore collection UI as well where you can review all your collected lore across every run. There is a lot of lore, and within that lore are elements that give the player access to new content. For example there are a fair number of special machine hacks that can be learned from NPCs and other sources, and knowing how to do these hacks can change player strategies on that and future runs. On an even greater scale, though, because maps do not generally exist in isolation--there are multiple factions and major game-changing events waiting to happen, so as the player learns about intertwining plot threads and their related features and strategies, different runs might choose to hit different points specifically with the goal of triggering other effects down the line. Or in reading the lore they've already collected up to a certain point in their many runs, players might deduce that something interesting could result if they tried X, so that's something they can aim for and perhaps get some new results from. Thanks again to Josh Ge for agreeing to talk with us. Cogmind can be purchased from its homepage, and from Steam.